This is a jokey Marvel UK House Ad, from December 1990, promoting their just-launched STAR TREK: THE NEXT GENERATION fortnightly comic/ magazine. Marvel seemed to really miss the mark with this one. I think fans were hoping/ expecting something along the lines of DOCTOR WHO MAGAZINE: a text-centric magazine dedicated to the still-in-production TV show with a comic strip element. Ironically, just the mix and formula that Titan Magazines followed when they launched their own TREK magazine a few years later (a formula also successfully applied to their STAR WARS and BABYLON FIVE magazines amongst others). 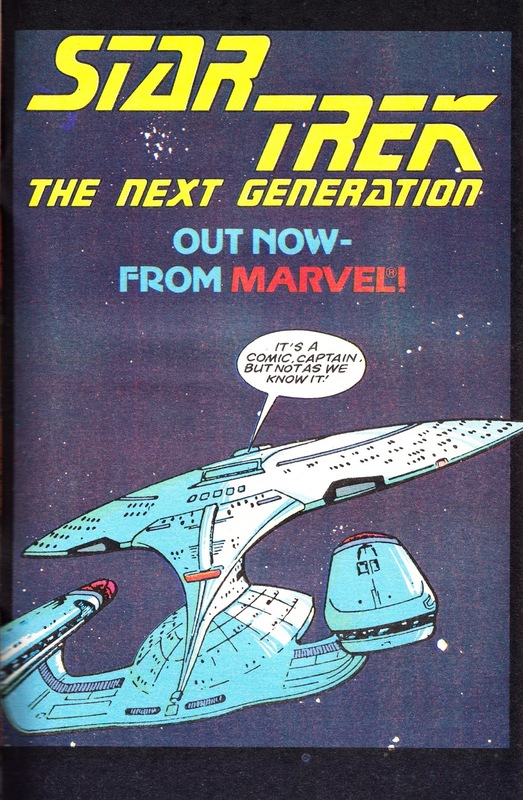 But Marvel chased a younger audience with an undemanding line-up of reprinted DC comics material (beginning with reprints of the six issue limited series, largely produced before the show had even started shooting) backed-up by text features lifted from Starlog's Official Magazine (Marvel didn't even change the page layouts, they just ran them as-is). Older fans with access to a local comic book store - and eager for anything TNG prior to the show's UK TV debut - would have already been familiar with both. Marvel's only new contributions: a contents page, a letters page and some truly dire covers (I'll do a cover gallery soon). After twenty-odd issues Marvel pulled their favoured trick of cutting the frequency to monthly in an attempt to stabilise sales and make the economics work (see also: DOCTOR WHO, FUTURE TENSE, RAMPAGE and OVERKILL amongst others). The relaunch, pitched at more "serious" fans boasted better cover designs (including a new logo), a more appealing balance of text features and comic strip and more UK-originated text features. The reboot was an improvement but, by that point, the damage was done and ST:TNG was squeezed out by superior coverage in British magazines like TV ZONE, STARBURST and DWB and imports like the Official Magazine and STARLOG itself (which seemed to have unlimited on-set access and at least one TNG feature per issue). When I first heard there was going to be an all-new Star Trek show with new characters I thought it might not be a success as we were all so fond of Kirk, Spock and co.- shows how much I know ! My great fondness is still for the original show, it reminds me of watching as a little kid as well as the '70s annuals and not forgetting the fantastic 1987 pop song - "It's worse than that, he's dead Jim !" and so on. I was quite excited by the prospect of new TREK. I just saw it as a new TV show which had the potential to be a good watch. I did eagerly devoured the news from the States (in the form of articles in Starlog, the Official Starlog spin-off magazine and even the Official Fan Club Magazine) around the time of the premiere and I made a point of renting the Encounter at Farpoint VHS as soon as CIC released the rental edition. Heretic that I am, I must admit to being largely unimpressed. I didn't abandon the show but i didn't bother to rent any of the follow-up tapes. I did, however, buy the first few sell-through releases and - later - bought most of them. The mind boggles how much I must have spent. I could have retired by now. More fool me!